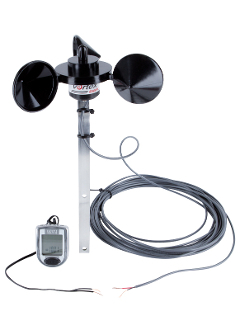 This rugged anemometer with dual digital display handles speeds from 5 mph to over 125 mph. Comes with 25' (8m) of exterior grade wire, with a twisted bare wire connection to the display. The Inspeed Pole Mount anemometer is great for mobile use where AC power is not available. Pole not included - but it does include a versatile metaal bracket with 2 holes for mounting to practically anything. Optional extra wire and display mount plaque available as well. The Inspeed Pole Mount anemometer is an affordable, affordable way to provide you with wind speed in places where AC power may not be available. You can mount this anemometer to your own pole or roof bracket, bring the wire in through a window or some other hole, and stick the display on the glass, a window, or anywhere you want. Connect the display and Voila! The Inspeed Pole Mount anemometer includes a high quality, Cateye Velo8 brand bicycle computer (please note!) to display wind speed. It also captures and stores MAX and AVERAGE wind speed, and includes wind mile odometers and a clock (basically stuff that cyclists care about but also apply to wind). Speed range is approx. 5 to around 150 mph. Calibration has only been verified from 5 to 50 - we did not find a wind tunnel with 150 mph calibration facilities! Battery life is around 1,000 hours of continuous use. Some anemometers we tested on our home lasted for well over a year on the original battery!